The helmet is the most important gear of a sportsman. Many players have died on the field due to not wearing it, and many others have suffered concussions etc. in spite of wearing one. Riddell’s Revolution IQ HITS (Head Impact Telemetry System) helmet is loaded with a system of sensors that stores data about the last 100 impacts, which can later be wirelessly transmitted to a laptop for analysis. Six helmets can be linked to each HITS receiver. The players and trainers can evaluate the data via a web app. 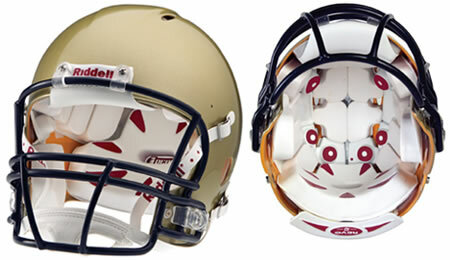 Riddell Revolution IQ HITS helmet is currently available. The helmet costs $999 and the HITS receiver costs $299. The University of Missouri and several other NCAA schools have already placed orders. – Ordering Instructions: Order HITS-equipped helmets using the item number shown below, along with all of the same options as the stock Riddell Revolution IQ helmet. – Helmet is delivered with MX Encoder pre-installed. Simple online set-up and registration is required prior to first use. …awesome that our revered athletic heroes can afford technology far superior to anything protecting our young men and women dying for the wealth of our god-fearin’ leaders!